Truck Facts: 2002 Chevrolet. Patrick race chassis. 572ci engine - 1200 horsepower. Custom aerodynamic wing, four link suspension, and 66x43 inch Goodyear tires. Paul's first Monster Patrol was built in only 15 weeks by Jack Willman Sr. of Taurus. Racing Background: Paul has been involved in motorsports for over 13 years, including motorcycle drag racing, circletrack dirt racing (thus the wing), 4 years of mud racing, and Monster Truck racing since 1993. Outstanding Achievements: 1992 U.S. Hot Rod Mud Racing World Champion. Paul purchased Bearfoot 4x4, Inc. in October of 1997 after Fred Shafer retired from racing. 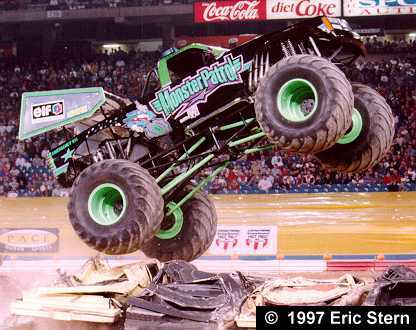 He then proceeded to purchase Extreme Overkill, Boogey Van, Wild Thang, Ground Pounder and Carolina Crusher in 1999. In 2000 he will own at least 13 different Monster Trucks.